Cyclones and Warnings and Names, Oh My! 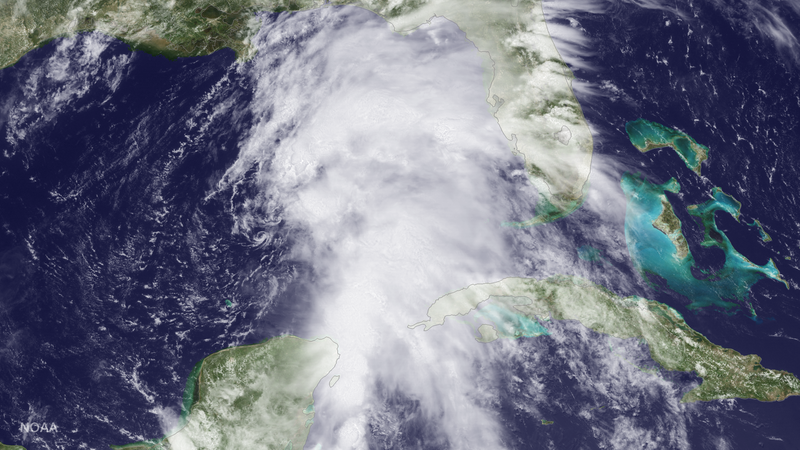 Visible satellite image of Tropical Storm Bill at 10:15 am CDT on Tuesday, June 16, just before it made landfall along the Texas coast on Matagorda Island. 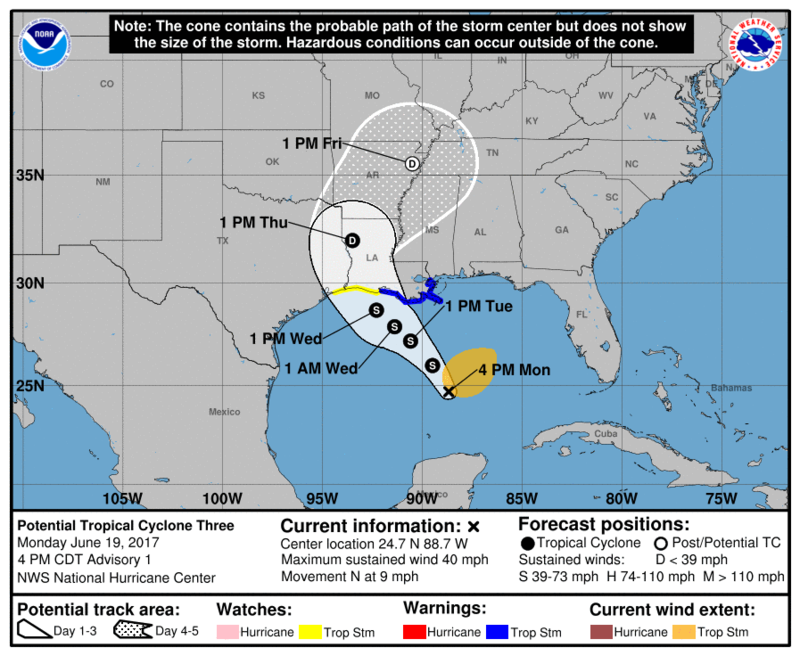 The development of Tropical Storm Bill so close to the Texas coast, with the posting of a formal tropical storm warning only about 12 hours before winds of that intensity came ashore on Tuesday June 16th, highlighted a long-standing and well-known limitation in the tropical cyclone program of the National Weather Service (NWS). An ongoing NHC initiative to improve service for such systems is the subject of today’s blog post. Although there’s nothing new about a tropical cyclone forming on our doorstep, what is new is an increased ability to anticipate it. NHC has greatly enhanced its forecasts of tropical cyclone formation over the past several years, introducing quantitative 48-hr genesis forecasts to the Tropical Weather Outlook in 2008, and extending those forecasts to 120 hours in 2013. In 2014, we introduced a graphic showing the locations of tropical disturbances and the areas where they could develop into a depression or storm over the subsequent five days. Thirty-six hours in advance of Bill’s formation, NHC gave the precursor disturbance a 60% chance of becoming a tropical cyclone, and increased that probability to 80% about 24 hours in advance. While nothing was guaranteed, we were pretty confident a tropical storm was going to form before the disturbance reached the coast. And although we weren’t issuing specific track forecasts for the disturbance, NHC’s new graphical Tropical Weather Outlook (example below) showed where the system was generally headed. We wouldn’t have had such confidence 20 years ago, or even 5 years ago. And so our tropical cyclone warning system, developed over several decades, doesn’t allow for a watch or warning until a depression or storm actually forms and NHC’s advisories begin; by both policy and software, warning issuances are tied to cyclone advisories. If we had wanted to issue a tropical storm watch for Bill on the morning of Sunday the 14th (48 hours prior to landfall), or a warning that evening (36 hours ahead of landfall), we would have had to pretend that the disturbance in the Gulf of Mexico was a tropical cyclone. Even during the day on Monday, data from an Air Force Reserve Hurricane Hunter aircraft showed that the disturbance had not yet become a depression or storm. 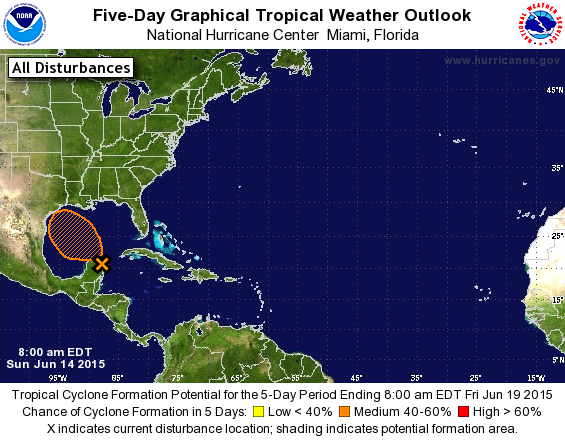 Couldn’t NHC have called the disturbance a tropical storm anyway, in the interest of enhanced preparedness? Yes, but what if the disturbance never becomes a tropical storm – remember, even an 80% chance of formation means it won’t become a tropical storm at least once every five times. So naming it early risks the credibility of the NWS and NHC, and endangers a trust we’ve worked for decades to establish. In addition, there are legal and financial consequences to an official designation of a tropical cyclone – consequences that obligate us to call it straight. And finally, as custodians of the tropical cyclone historical record, we have a responsibility to ensure the integrity of that record. When systems that have the potential to become tropical cyclones pose hazards to life and property, NHC’s best avenue for highlighting those hazards currently is the Tropical Weather Outlook. Ahead of Bill’s formation, the possibility of tropical storm conditions along the middle and upper Texas coast was included in the Sunday evening Outlook, and by early Monday afternoon the Outlooks were saying those conditions were likely. Products issued by NWS local forecast offices (WFOs) carried similar statements. Although most folks seemed to have gotten the message that a tropical storm was coming, it’s widely thought that the Tropical Weather Outlook and local WFO products don’t carry the visibility and weight of an NHC warning, or of an NHC advisory package with its attendant graphics. 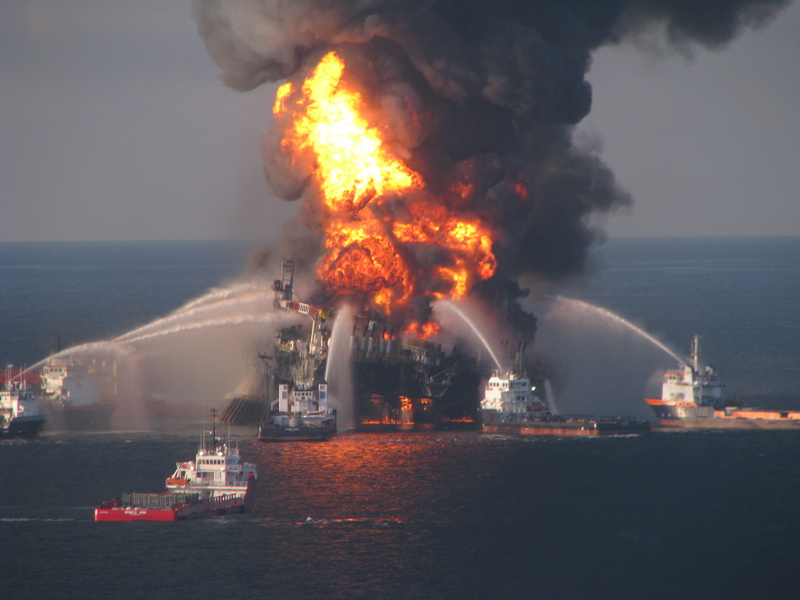 In addition, some institutions have preparedness plans that are tied to the presence of warnings. We agree that warnings during the disturbance stage could improve community response, and we’ve been working toward that goal since 2011. In that season, NHC initiated an internal experiment in which the Hurricane Specialists prepare track and intensity forecasts for disturbances with a high likelihood of development, and use these forecasts to determine where watches and warnings would have been appropriate. These internal disturbance forecasts have had some successes and failures, but may now be good enough to make public. With our colleagues across the NWS, we’re now working through the logistics of expanding the tropical cyclone product and warning suite to accommodate disturbances. 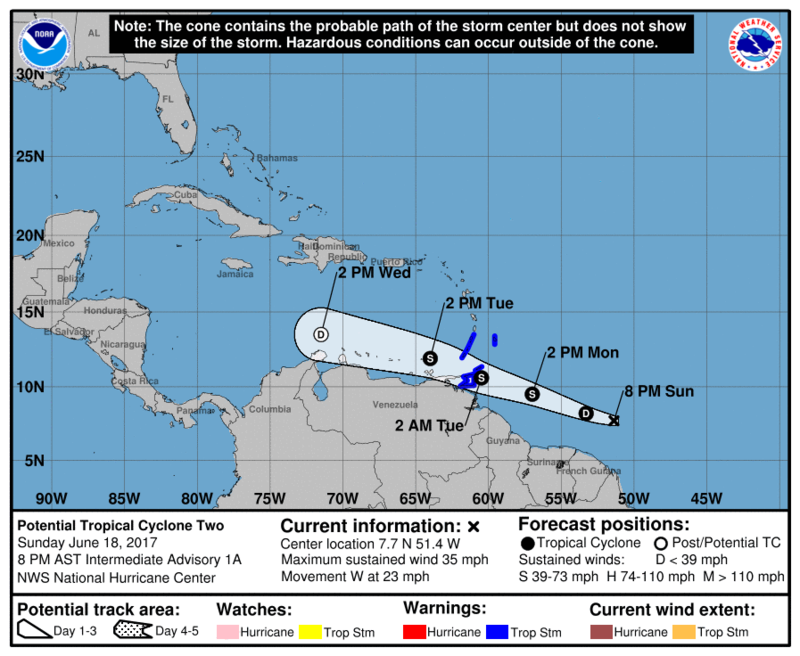 One plan under consideration calls for NHC to produce a five-day track and intensity forecast for those disturbances having a high chance of becoming a tropical cyclone, and which pose the threat of bringing tropical-storm-force winds to land areas. The forecasts would be publicly issued through the standard NHC advisory products, including the Public Advisory, Discussion, and Wind Speed Probability Product, along with the forecast cone and the other standard graphics. These advisory packages would be issued at the normal advisory times, and continue until the threat of tropical-storm-force winds over land had diminished. 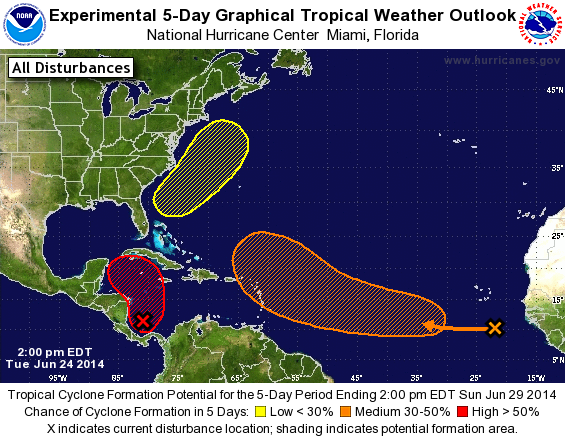 If and when the disturbance became a tropical cyclone, advisory packages would simply continue. We are still evaluating these and other options for getting tropical cyclone warnings out for potential tropical cyclones. 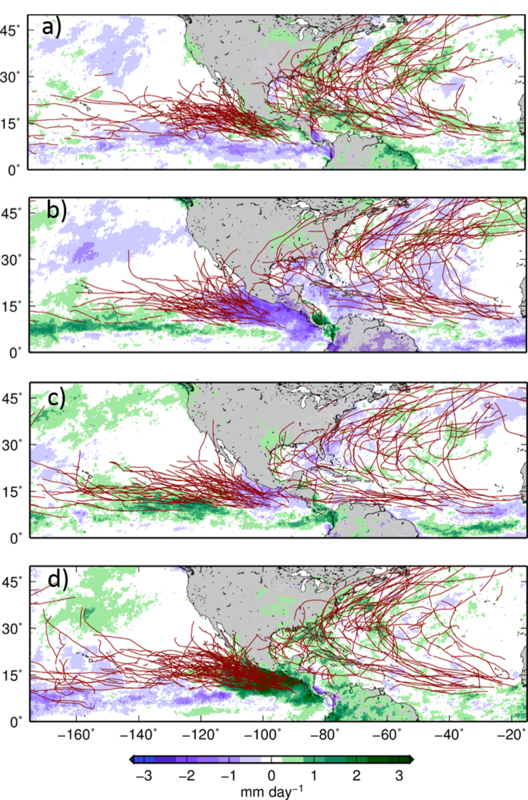 If we do begin issuing forecasts for these systems, we know from our experimental forecasts that they won’t be as accurate as our current public forecasts for tropical cyclones are – and we’ll want to make sure users know about those uncertainties. There are many details to iron out and much technical work to do, but we’re hopeful to have this service enhancement in place for the 2017 hurricane season. This entry was posted in Forecasting, Genesis, NHC and tagged genesis, Texas, Tropical Storm Bill, warnings. For many years NHC’s forecasts of tropical cyclone formation extended only 36-48 hours into the future. Recent advances in numerical modeling, however, as well as improved understanding of some of the physical triggers for genesis, prompted NHC to begin an in-house experiment to see whether its genesis forecasts could be extended. 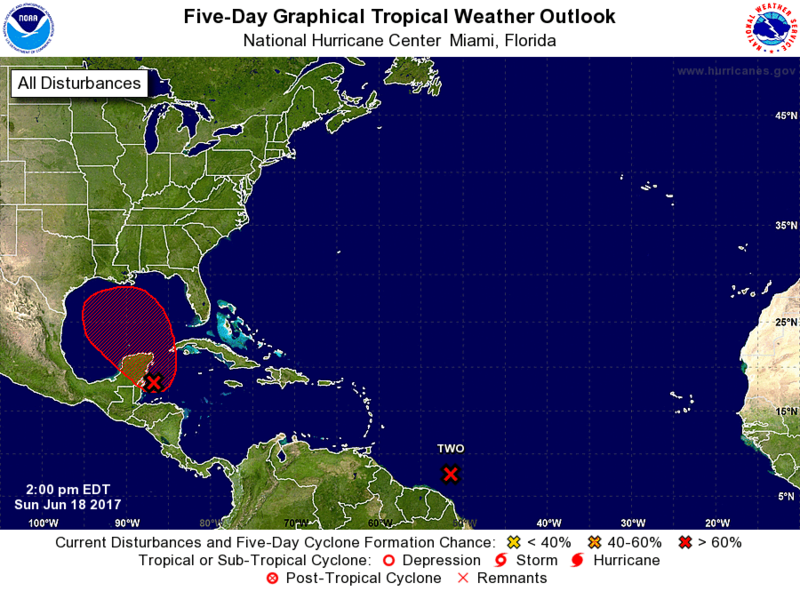 The four-year experiment showed, somewhat surprisingly, that a five-day tropical cyclone forecast could be made with nearly the reliability of the existing 48-hour forecasts, and NHC publicly extended the range of its Tropical Weather Outlook (TWO) text product to five days on August 1st of 2013. 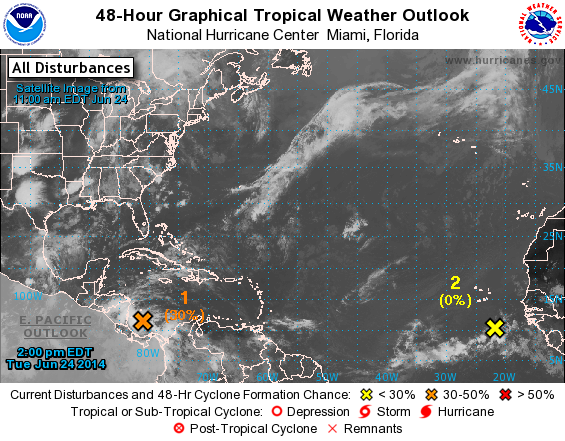 In its present form, the text TWO describes areas of disturbed weather and their potential for development into a tropical or subtropical cyclone. 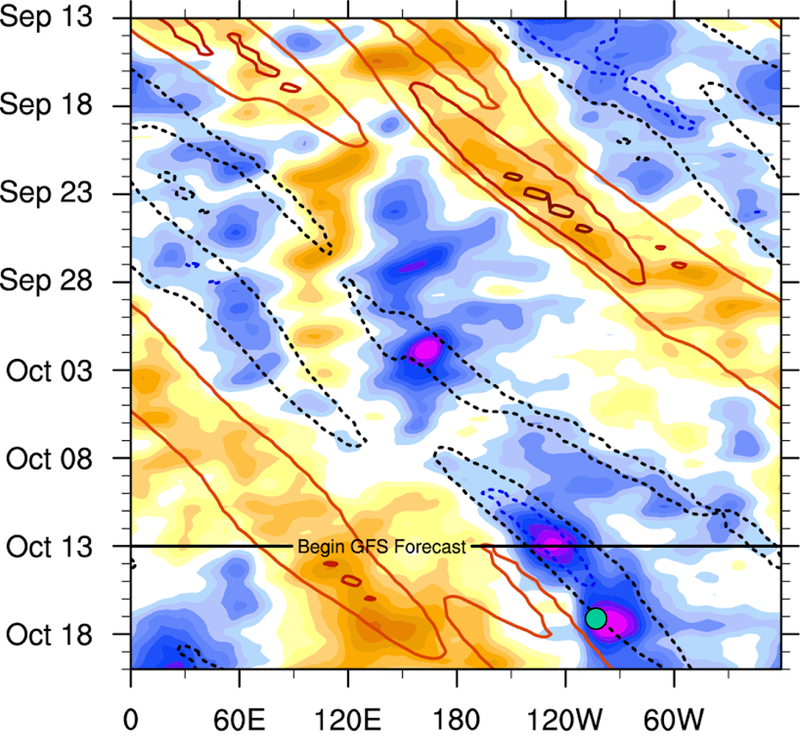 This description normally includes discussion of the large-scale factors that could influence development, the general motion of the disturbance and any hazards that might affect land areas, and concludes with a quantitative forecast of formation likelihood for both the next 48 hours and the next five days. Beginning today, July 1, 2014, at 2 PM EDT (11 AM PDT), the text TWO will be accompanied by an experimental graphical depiction of the five-day potential cyclone genesis areas. These areas will appear as color-coded hatched areas (yellow, orange and red representing low, medium, and high risks of tropical cyclone formation, respectively). Although the areas or swaths don’t explicitly represent a track forecast, they do provide a general indication of where these systems are headed whenever the formation potential extends over several days. If a hatched formation area is associated with a currently existing disturbance, the location of the disturbance is marked with an ‘X’ on the graphic. Arrows are used to link the location of a disturbance with its potential genesis area if the formation area is displaced from the current location of the disturbance. The overview graphic (above) can occasionally become crowded with disturbances, especially during the peak of the hurricane season, so separate graphics for each disturbance are created to ensure legibility. The introduction of the five-day graphic on July 1st will be accompanied by an important change to the existing 48-hour graphic. Disturbances on this graphic will no longer be identified with circles or ovals; instead the location of current disturbances will be marked with an “X” for consistency with the five-day graphic. This entry was posted in Forecasting, Genesis, NHC and tagged genesis, outlook, Tropical Weather Outlook.